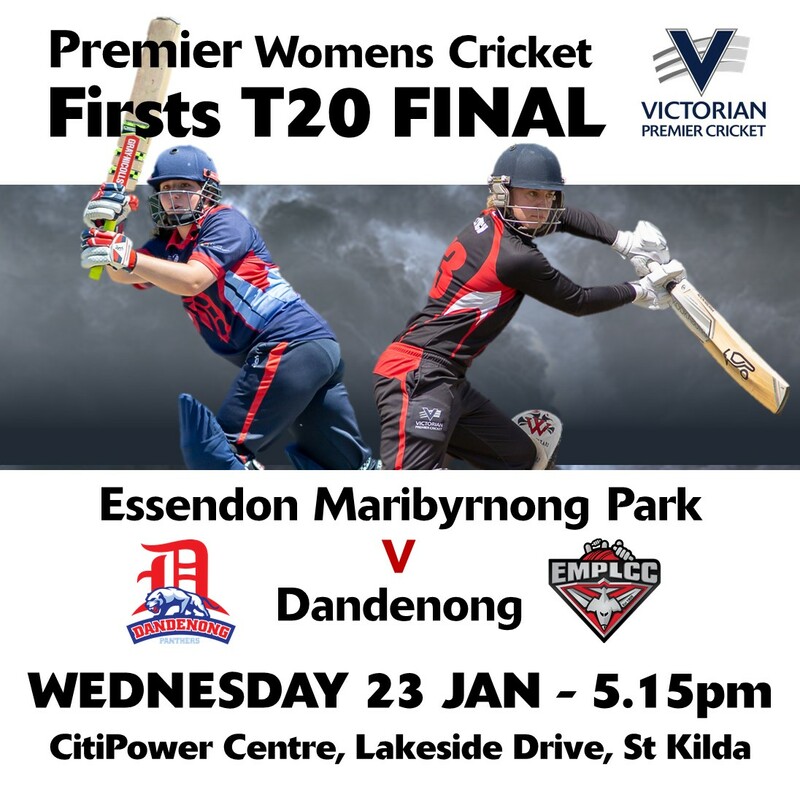 The first Final of the Premier Cricket season is upon us and it is the Women’s Premier 1st XI T20 Grand Final between Dandenong and Essendon Maribyrnong Park. Both sides finished the Home & Away component of the T20 season on 20 points, with Dandenong’s Net Run Rate keeping them ahead of Essendon Maribyrnong Park (1.4544 to 0.9301). These sides had a dress rehearsal last Sunday at Shepley Oval Dandenong with Essendon Maribyrnong Park winning by 20 runs thanks to performances from Makinley Blows (62 off 58 & 2/24 off 4), Natalie Schilov (54* off 45) and Chloe Rafferty (2/14 off 3), while Dandenong was best led by ex-EMP spinner Maryam Omar (18 off 15 + 3/24 off 4) and Ireland representatives Kimberley Garth (53 off 54) and Laura Delany (30 off 37). This game contains some Australian Team feelings, with Panther Sophie Molineux up against Bombers and fellow Australian representatives Kristen Beams, Georgia Wareham and Molly Strano. The battle in this game is expected to be how each team bats in their innings. For the Panthers, Sophie Molineux has made 130 runs in just 2 T20 innings (with a knock of 102 against Carlton-Brunswick in the opening round), while Irish representative Kimberley Garth is their next highest with 104 runs. For the Bombers, Jenny Taffs leads the competition with 169 runs (with a top of 85 against Plenty Valley in Round 6), while Molly Strano is their next highest scorer with 84 runs. With the ball, the Panthers have been led by Chelsea Moscript (7 wickets), with support from ex-EMP spinner Maryam Omar and skipper Emma Gallagher (5 wickets). For the Bombers, Chloe Rafferty has led the attack with 6 wickets, while Kristen Beams (5 wickets) has been in form when WBBL commitments allowed her to play. My prediction is this game will go down to the wire, with the gut feel suggesting the T20 trophy may find a new home down at Shepley Oval. This game is on Wednesday Night (23rd January) from 5:15pm at the Junction Oval, with the game to be live streamed by MySport Live via the Victorian Premier Cricket Facebook page. The Women’s 2nd XI T20 Grand Final will take place on Friday Night (25th January) from 5:15pm at Harry Trott Oval between Melbourne and Box Hill. Melbourne led the table most of the way, while Box Hill had the luck of Plenty Valley losing one of their double-header matches last weekend against Ringwood, while they defeated Dandenong in both games to qualify. With the bat, Pennie Harrison leads the Mustangs scoring with 98 runs, with Hailey Ferris (75 runs) the next highest. For the Demons, Jordan Watson (94 runs) is the Demons highest, with Parry Jenkins (73 runs) and Bridie Chesterfield (67 runs) also providing some support with the willow. With the ball, the Demons are led by Kampi Nainhabo (8 wickets), Parry Jenkins (6 wickets) and Jordan Watson (5 wickets), while the Mustangs have been led by Brylee Barker (5 wickets) and Ashling O’Farrell (4 wickets). Going on results, my feeling on this match suggests the pennant may be just heading up St Kilda Road to the Albert Ground but it will be in a close match.